I've said this way too many times, but it's hard to believe my little trip is over. I know this will sound almost sacrilegious, but while I was Italy I craved American food like no other. It's not that I don't love Italian food, because I do. I just wanted something a bit different. As soon as I arrived home, I made apple fritters (I am a southern girl at heart). Then I had a peanut butter and jelly. Then an all-beef, kosher hotdog with lots of sauerkraut. And I should let you know that I rarely eat hotdogs, the last time I had a Poptart was when I was in elementary school, and I only drink soda when it's mixed with adult beverages. Another one of the foods that I missed dearly while I was away was cheesecake. You'd think in a country where cheese was so important they would make some kind of cheesecake, but I didn't find any while I was there. I suppose that is my excuse for my overconsumption of gelato. 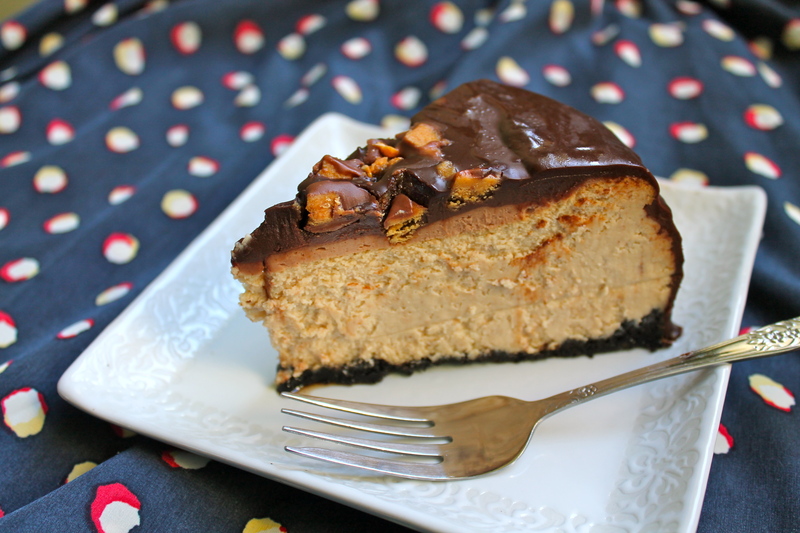 This cheesecake is so creamy and rich. It's a lovely summer dessert because it's cool and sweet. 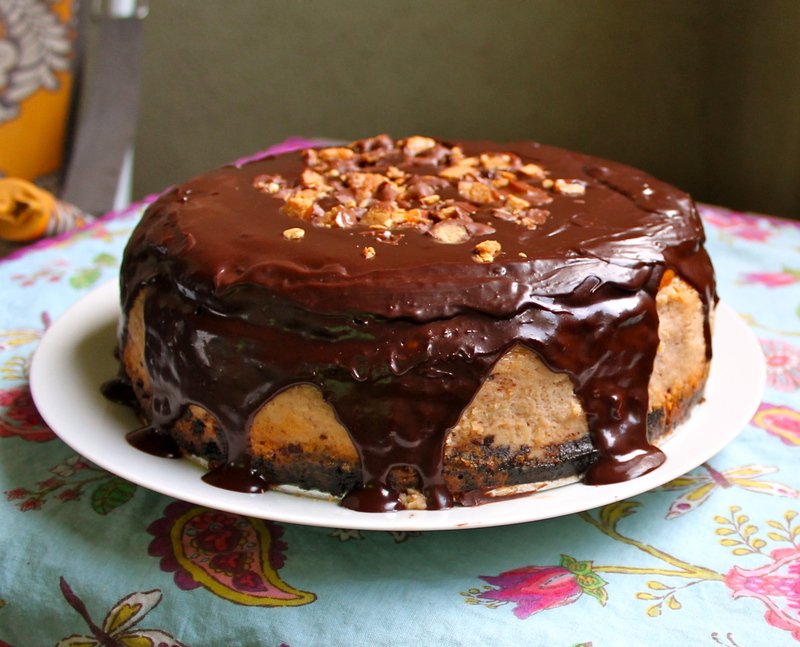 The ganache is optional, but highly recommended. 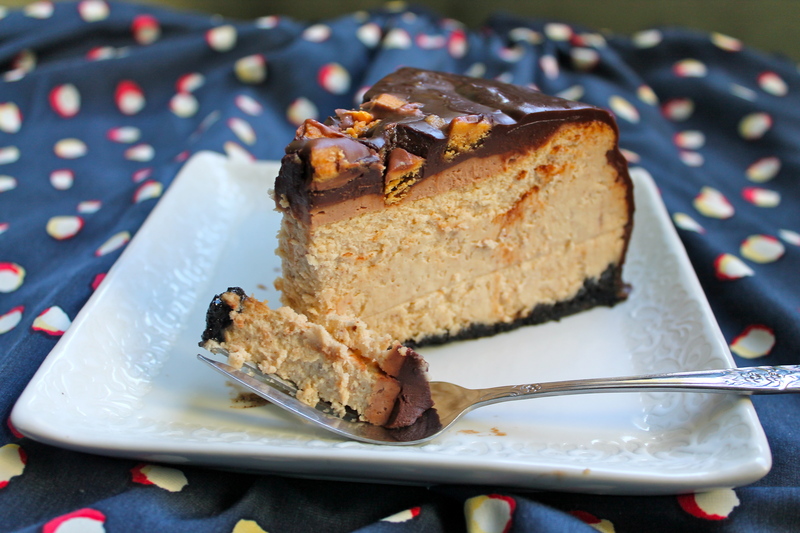 Also, you can use whichever candies (or no candies at all) to top the cheesecake. I chose chopped Reese's cups and a Reese's candy bar, but I think you could really use any candy bar/chocolate chips/chocolate shavings/etc. 1. Preheat oven to 350°F. Prepare a springform pan (Here is a link to another tutorial): Separate the circular bottom piece and side "cylinder" piece that opens. Place a piece of parchment paper over the circular bottom, making sure that it completely covers it. Reassemble pan and lock in place. You can trim up the parchment if you'd like. Grease the sides and bottom with butter. 2. In a medium bowl, mix together the Oreo crumbs, melted butter, and sugar. Press the crust into the prepared pan. You can place the crust on just the bottom, or you can push it up the sides if you'd like. If you decide to push it up the sides, you may need to make more crust. 3. In a standing mixer (or with a hand mixer), cream the cream cheese on low until very smooth. Next, add the sugar and flour and continue to beat until incorporated. One at a time, add the eggs on low speed. After the eggs are incorporated, add the sour cream, whipping cream, and vanilla on low speed. Mix until smooth. Finally add the peanut butter to taste. Beat on low until smooth. Pour the mixture into the prepared crust. Place on middle rack in oven (I put mine on top of a sheet pan) for one hour and fifteen minutes until the cheesecake shakes with a dry jiggle (not uncooked jiggle, if that makes any sense). 4. While the cheesecake is baking, prepare the sour cream topping by mixing the sour cream, sugar, and peanut butter. Once cheesecake has finished baking, immediately place the sour cream mixture on top. Place back into the oven for 8 minutes. 5. Remove cheesecake from oven and allow to cool completely on the counter, 4-6 hours. Next, place cheesecake in the fridge until completely cold, 3 hours to overnight. 6. When the cheesecake is cold, you can make the ganache. In a small pot over medium heat, heat the whipping cream and stir occasionally. Once the cream begins to gently boil, quickly remove it from heat (it will boil up very fast). Add the chocolate chips and cover for five minutes. After five minutes, whisk the chocolate and cream until combined. 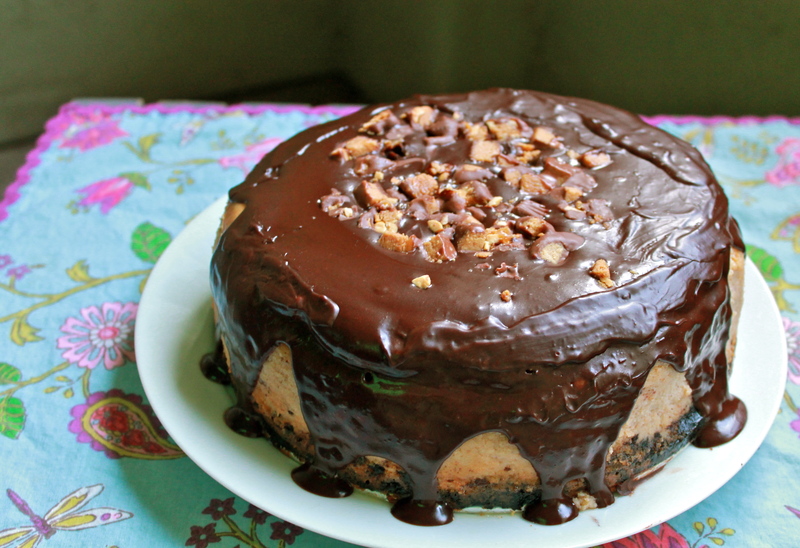 Allow the ganache to cool for about 30 minutes and then carefully drizzle over the cheesecake. While the ganache is still wet, sprinkle the candy bar pieces on top. Return cheesecake to the fridge until ready to serve. Storage Store cheesecake in the fridge in a covered container or with plastic wrap. Stays for up to one week. Cheesecake also stores well in the freezer for up to one month in an airtight container.